I started This Welsh Mother in March 2017. I had launched a Catering company with my partner James in 2016 and things were going really well. I had, for the most part, given up my previous business and was making a bit of money writing a blog about my journey as a first time mum. I have loved writing for as long as I could remember but writing about me all the time didn't seem the right fit. At the beginning of 2016 I was trawling the Internet for some parenting stuff. I don't really know what I was searching for, support, a laugh, things to go to, who knows But what I do know, is that I was sick of spending my day's on Instagram seeing all these really fab mum-clubs and events all happening in big cities. I knew Welsh Bloggers. I knew of some Welsh based groups but I couldn't find what I was looking for, so late one night I started it. Within 30 days of sharing the Facebook page on my personal Facebook profile it had over 1,000 Likes - and I knew I had the interest I needed to build a website. The thing with blogging or running a website is, that you either take the pressure off and blog as a hobby - no deadlines, no need to monetise, slow & steady OR you make it your job and in that event, prepare yourself for a hefty amount of work. 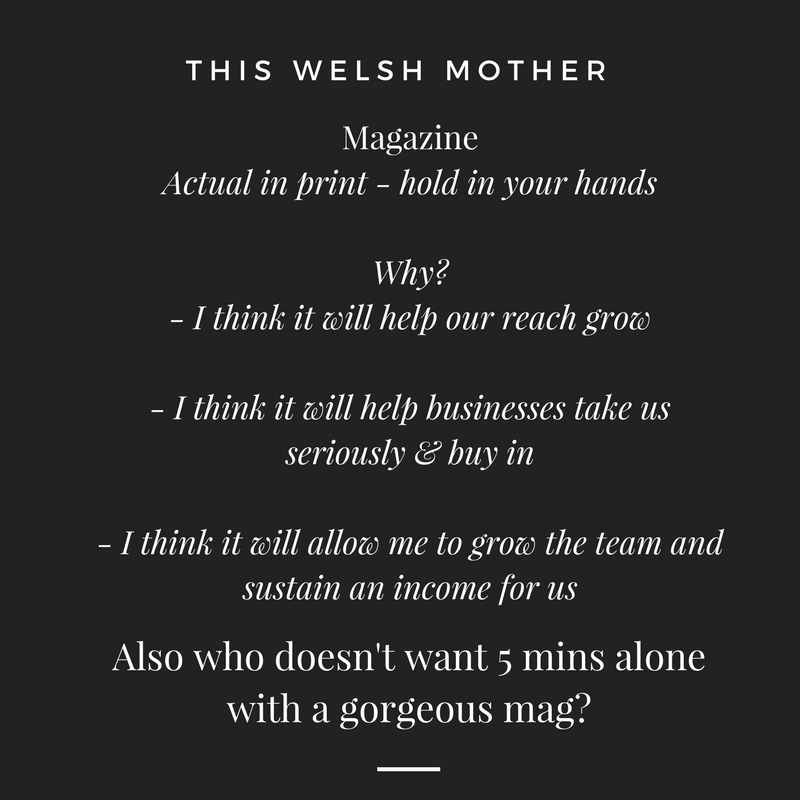 I knew I wanted This Welsh Mother to be my next business project so I set out my plans in my original 'Manifesto' blog post. Soon after starting I realised that This Welsh Mother was a big project. In order to keep the reader numbers high I had to write new posts daily, schedule the social media on twitter, Facebook & Instagram. Email PR companies, handle product and review inquiries and be around to comment on everything that got posted on our (very busy) Facebook page. It was not a chore, because I loved it. But girl, it was a lot of work on top of my existing business, occasional freelance work and a one year old who never slept more than 4 hours. Over time we had great guest posters like Hayley Raine-Diplock (who went on to start her own blog 'Winging it with two boys', Amy from the organisation 'Single Parent Wales' & I can Cards and the wonderful Charlotte who writes 'Musing Mum' blog) - all of them helped me keep this thing going. In August last year I joined a group of businesses inducted into the E-Spark programme in Cardiff. I went there to work on my plans for This Welsh Mother and get feedback from some great business minds but I struggled with it. I struggled because a lot of people still don't fully understand digital based businesses and especially not ones like this but I thrashed out ways to get this business to be financially viable. And then I took some time out. I think in all businesses there comes a crunch point and mine was in November last year. I attended the first ever Youpreneur event in London. I ended up Masterminding with some of my business heros and totally geeking out on business stuff for 3 days with one of my best friends in the world. Youpreneur took me out of my village and the world I had become accustomed to since becoming a Mum and it threw me back into one that I was very used to in my 'old' business life. It was freeing. I couldn't perform in the same way that I used to and that was a very hard pill to swallow. There is a pace to my old industry and it was like stepping out onto a treadmill that was already set to 23. I needed a slow jog, they needed a sprinter. You can only split yourself so many ways and know when you do, you spread yourself thinner with each slice. I quickly found myself feeling that I was 'making do' all over the place. I didn't feel I excelled at work, I felt like a really crappy parent & a very absent partner. After spending time thinking about that, I wanted no part of it. and finally, the time is never right but the time is now. When I took a look at the advice I had given to friends, coaching clients & even companies - I could see I was taking none of it myself. I can see I have changed but not everything has. I still think I'm hilarious. I still think I'm really good at business and I'm happy to admit, I do not give two flying frigs about failing. One of the additions I've found since Motherhood is an honesty and acceptance for certain traits I may have kept hidden pre-child. I have a weird, awkward personality. I'm extremely outgoing and confident and yet I blinking love spending a lot of time alone. I do not want to blend in, ever. I'm comfortable with myself. With My face. With my humour. So why not try? I fear that we have been conditioned that trying something new is for the young. That Youtube and Instagram are for Fitness models and people with remarkable faces & houses. That is not me. And let's face it, I am unsure how many 35 year olds have decided to start a media company from their spare bedroom, In Pontypool. For all it's hardships, Mothering Fred has made me feel like living anything else than a truly fulfilling life is doing both of us a disservice. Motherhood has made me feel like I have to show him that being exactly who you are and following your real passions are the biggest goals to reach in life. This won't be easy and I fully accept it might not work out - But if there is one thing I do well, It's launching. I just know in my bones that this could be such a great thing! But, I can't do it alone. Without you, none of this is possible. You can help by getting involved with the site, offering to write something or appear in the podcast? Nominating yourself for a column, suggesting places, topics or people you'd like to see or hear from (you can do all that by emailing ceri@thiswelshmother.co.uk) and if you have very little time but you still want to support Welsh Mothers simply like our social posts if you see them and if we post a new blog post 'Just Click Through' - it takes seconds but it is those numbers and interactions that help me keep this business going at the moment. Transparency and being realistic is really important to me - so 've thought of a few way's to document this whole process and i'd love to take you along for the ride.